Last post about Journey through Miles of NBA Travel History wasn’t the exception. To measure distance I needed a schedule… and with that information in place why not analyze NBA’s schedule itself? 1) NBA Truly Hates Mondays. Not only on Mondays there was by far the least amount of games played but also NBA season usually starts just after this day. Obviously those facts are related but even if we adjust start of every season, Mondays still would be the least favorite day for the NBA. Was Monday the worst day to attract customers? 2) NBA isn’t a fan of Sundays and Thursdays either. 3) The most games in NBA history were played on Friday. Also Thursdays really took a hit 8 years ago. Was it a move to accommodate some wishes from TV? 4) The most busy month was January followed by February and March. Is this another influence of NFL? 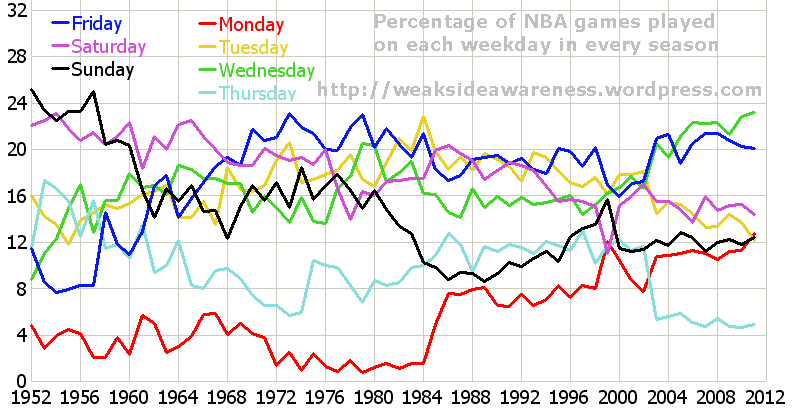 NBA moved into higher gear around the time when football was slowing down [at least in terms of number of games played]… this can’t be coincidence, can it? 5) Favorite day to start a season changed through time. In the first two decades it was Saturday, in the next three Friday and in recent ones it has been Wednesday. That’s probably related to number of games played so NBA could finish it’s schedule at desired date. – It’s true that Utah tries to avoid games on Sundays. It’s also a reason why they play a lot games on Mondays. – perennial winners like Lakers and Celtics played often on Sundays. Explanation of game days is simple: reason for relaxed Mondays and Thursdays is the weekend schedule. Friday through Sunday is the easiest time to get people in front of the TV, and it’s probably connected to price of commercials. So Mon and Thu need to be more relaxed days in in order not to create 3 games in 4 nights problems too often.